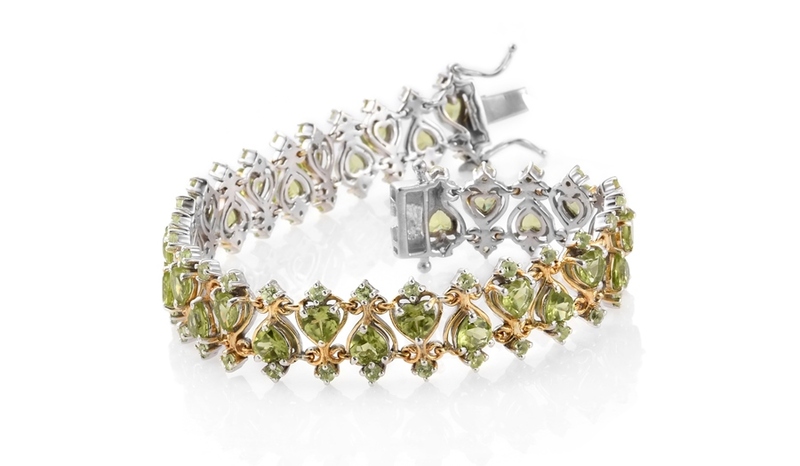 Featuring an enchanting olive hue, Arizona peridot captivates with intriguing displays of sparkle. Peridot is the pure green, to a yellow-green or greenish-yellow crystal of the mineral olivine. It forms deep inside the Earth, and is brought to the planet’s surface through volcanic activity. 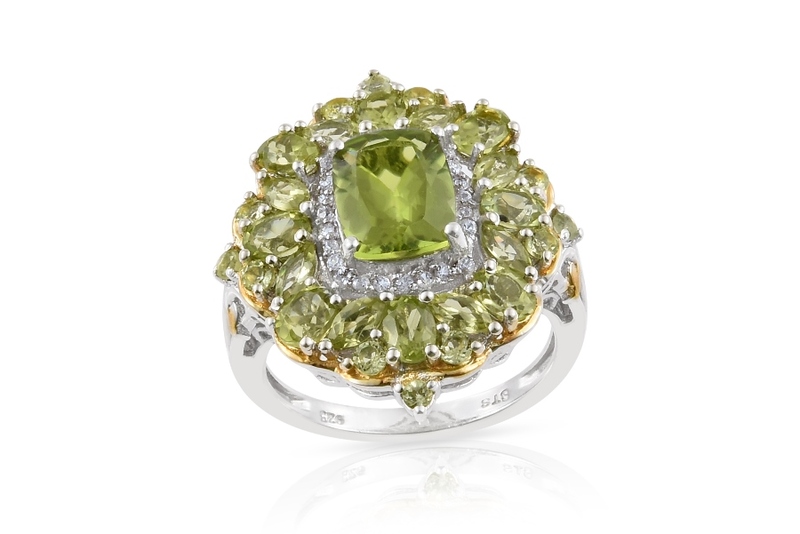 Most peridot used in the gem trade is of the vibrant and bright yellow-green variety. Peridot from Arizona, however, is a highly prized olive tone. Within the industry, it is this shade that typically commands the highest price, as it is not as common as the other varieties found. Trace amounts of iron provide the gem its unique color. Most gem-quality peridot from Arizona is around one carat in size after cutting and polishing. Finding the same quality in sizes up to five carats becomes increasingly rare. It’s practically unheard of to see stones over two or three carats in size. A commonly used size, one carat stones are ideal for faceting into familiar calibrated shapes such as rounds, ovals, and pears. A versatile stone, many forms are represented, including beads and designer cuts. Finished stones are often “eye-clean,” meaning they are free of visible inclusions. A common inclusion seen within the stone are “lily pads,” a round disc shape named for the water plant it resembles. After polishing, stones possess a glass-like luster. Arizona peridot is natural and not treated in any way. 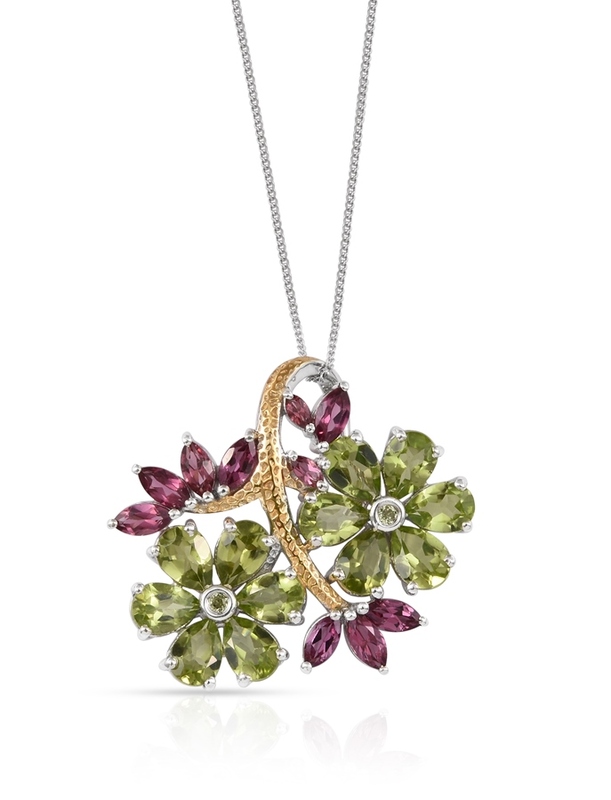 • Peridot, alongside pink spinel, is the modern birthstone for August. Since the early 20th century, peridot has been used as the official birthstone in the United States for those born in August. In 2016, pink spinel was paired with peridot to represent the month, replacing sardonyx. The United Kingdom continues to recognize the peridot and sardonyx pairing. • From a historical perspective, peridot was a gemstone used to represent those born in September, before the modern birthstone list was developed. Peridot can also be considered a birthstone for those born under the zodiac sign Libra (September 23rd – October 23rd). • Before our modern understanding of gemology, gemstones would be grouped according to color. This resulted in different stones being sorted together into a single category. Chrysolite is an out-of-date term for a variety of green gemstones that possessed a primarily yellow-green color. Many experts agree that peridot was strongly represented in this category. Other stones may have included chrysoberyl, tourmaline, topaz, and zircon. As understanding of gemology progressed, the term slowly fell out of fashion. • The word peridot has an uncertain origin. Popular lore suggests its roots in the Arabic faridat. The word simply means gem. Though peridot was often referred to as chrysolite in the past, peridot has grown in popularity among experts in the gem trade. Primarily, this is due to the number of gems that already make use of the “chryso” prefix, such as chrysoberyl or chrysoprase. In antiquated references, peridot may still occasionally be referred to as chrysolite. • In mineralogy, olivine is the preferred name for the gem. Peridot is found in several locations across the globe. The majority of commercial material is produced by the United States and China. 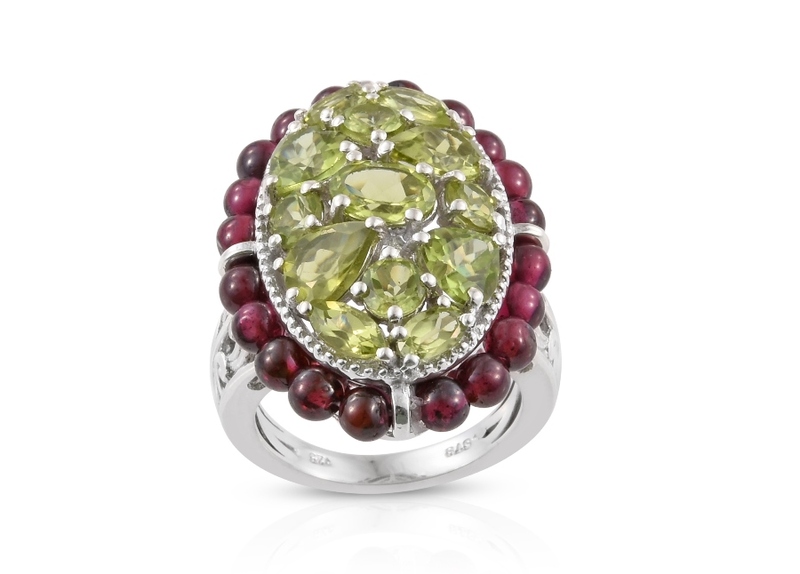 Arizona peridot comes from the San Carlos Indian Reservation in Southeastern Arizona. Only members of the reservation, primarily Apache, and their families can mine for peridot on reservation lands. The reservation is located about 20 miles east of Globe, Arizona – the home of Sleeping Beauty turquoise. Tribal miners employ traditional techniques and tools in mining this stone. Once Mother Nature has exposed hints of rough from natural processes like erosion, the miners do the rest. The basalt rock is worked with hand tools, such as picks, to expose peridot rough. Occasionally, drilling and blasting techniques will be employed to break down larger formations into manageable chunks that can be finished with jackhammers and picks. Miners work in small teams for mining. These operations typically number in groups of fewer than ten. Much of the material is processed overseas before being returned to Arizona for distribution. Tribes have historically preferred to deal with local brokers in distributing their yields. These brokers will be the ones to grade and sort the mined rough for cutting. Thanks to our close network of partners, Shop LC has been able to strike deals to bring peridot jewelry to our audience. Shop LC procures mined rough that we cut in-house. It is a challenging stone to cut, as crystals are jagged and can shatter easily in unskilled hands. Cutters will follow the crystal pattern for the best return on their effort. Patience and accuracy are essential during work. Even then, good rough peridot typically will yield about five to ten percent finished material – a faceted gemstone ready for jewelry setting. Peridot Mesa is the single largest claim on the reservation and accounts for the majority of peridot produced on these lands. In fact, Arizona leads the production of peridot gemstones for the commercial market. Only China rivals this location, with localities such as Hebei Province producing a popular yellow-green variety. Despite foreign operations, estimations suggest that 80 – 95% of the world’s supply is produced by the San Carlos Indian Reservation. 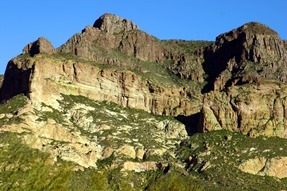 Arizona peridot is primarily of an olive hue, though other tones are possible. Sourced from the San Carlos Indian Reservation, Arizona. The material is not treated.